10) He covered Bryan Adams' "(Everything I Do) I Do It for You" while wearing a conch-shell necklace. 9) He did a college radio commercial during which he just sighed in different tones for 30 seconds. 8) He moved to Seattle, then realized he didn't play for the Mariners. 7) He gave Alanis Morissette a "jagged little pill," if you know what we mean. 6) He "totally wrote the words 'mellon collie and infinite sadness' on a bar napkin three years — three full years, bro — before those corporate-sellout hacks the Smashing Pumpkins used it as an album title." 5) He did MTV's "Unplugged" — in his own garage. 4) He often complained, in a beaten-down tone, that the mainstream just didn't understand his goatee. 3) He had to be rushed to a hospital after nearly drowning in flannel. 2) He once stormed off the stage because a 43-year-old mother of four in the front row was wearing the same vest as him. 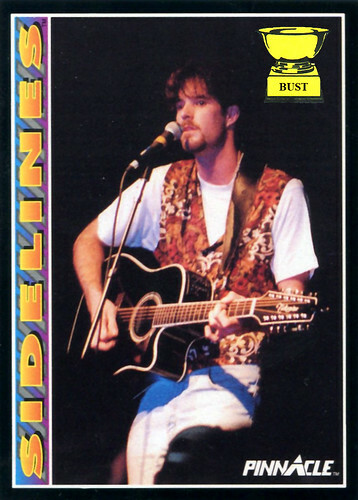 1) He and his band, Stickfigure, reached the "pinnacle" of their career when they played at The Peach Pit After Dark in the background of a "Beverly Hills 90210" episode. McDowell would have changed one of its hits to "Mullet with Butterfly Wings."